Due to the unpleasant weather and the poor field conditions of our Pairc Naomh Mhuire our home game against Ballybay, on Sunday 19th May, in the Drumlin Credit Union senior football league campaign was switched to their grounds. Unfortunately, there was a touch of Déjà vu because once again two goals conceded within the first five minutes proved vital and we’re back to the old cliché again with the well-worn line that ‘goals win games’ as Ballybay secured a comfortable victory on a final score-line Ballybay 3-15 Rockcorry 1-12. Ballybay, who always looked the better side, dominated right from the throw-in and made a tremendous start which yielded an answered two goals during the opening five minutes which propelled them to a comfortable six point cushion. 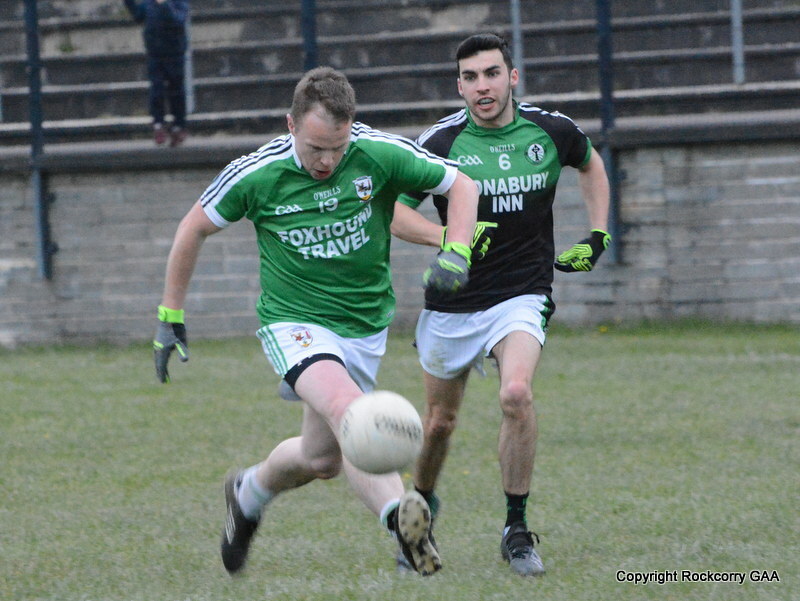 Fergal McGeough, who throughout the game caused consternation every time he got the ball and proved a constant thorn in Ballybay’s side, stopped the rot when he pointed a free-kick on the 8th minute. However, this was quickly cancelled out because again we were guilty of losing possession and Ballybay capitalised when they pointed neatly. 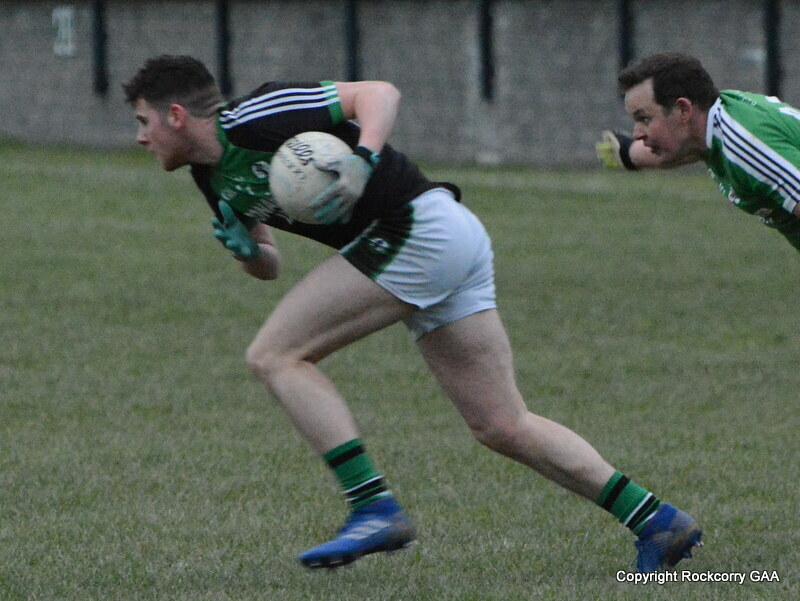 Niall McKeown, who incidentally was returning from a hamstring injury was lined out wearing the number fourteen jersey, and when he was brought down on the 11th minute Fergal McGeough duly tapped the ball over the bar to leave the score-board showing Ballybay 2-1 Rockcorry 0-2. Sadly, we continued to commit a lot of unforced errors and every time Ballybay took advantage and stretched their lead further with three points in as many minutes to lead, 2-4 to 0-2 midway through the first half. Fergal McGeough converted another free-kick on the 16th minute following a foul on Johnny Reilly but Ballybay added a fine point moments later with a swift counterattack. Jamie Smith pulled off a brilliant save on the 18th minute to deflect the ball around the upright but almost immediately after Ballybay lobbed over a free-kick to lead by nine points 2-6 to 0-3. On the 24th minute, Niall McKeown’s goal attempt was well saved by the Ballybay goal-keeper and Keelan Clerkin kicked wide before Paul Mckeown weaved his way through the Ballybay defence and was hauled down, and with Mark Daly out injured, Mark McGuirk coolly sailed the ball between the uprights. Moments later Mark McGuirk was in the thick of the action again and when he was brought down Fergal McGeough showed his accuracy and bisected the uprights with a lovely score. 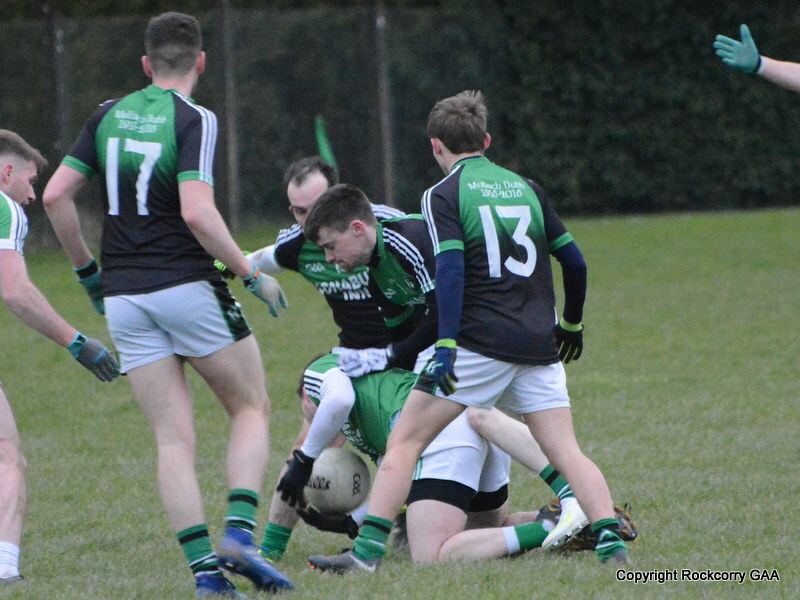 Martin Carroll was denied a goal on the 28th minute when he found space in behind the Ballybay defence but once again the Ballybay goal-keeper showed his qualities and produced a top-quality save. With half time approaching Balylbay notched over two more points to leave the score-board showing Ballybay 2-8 Rockcorry 0-6. When play resumed we got out of the stalls the quicker and registered the first score after forty-five seconds when Fergal McGeough made a strong run and kicked a delightful score. Ballybay responded with a converted free-kick on the 3rd minute and moments later we had a great opportunity to reduce the deficit when Niall McKeown skipped past his opponent and found himself with only the goal-keeper to beat but the Ballybay custodian once again showed he was on top of his game and made a superb save. Mark McGuirk lofted over a free-kick on the 6th minute but Ballybay, who always looked dangerous on the counter attack, pointed shortly after. Noel Carroll, who was also returning from an injury, showed his lightning pace with a great solo run on the 8th minute that ended with Mark McGuirk pointing in style to leave the score 2-10 to 0-8. Noel Carroll pointed a free-kick from close range after Fergal McGeough was fouled but Ballybay could always respond with what appeared to be at ease as they notched over a free-kick on the 12th minute and pointed two minutes later to maintain a healthy advantage, leading 2-12 to 0-9. Admittedly, we were slightly fortunate on the 15th minute, when we were awarded a rather fortuitous penalty after Dwayne Rooney was adjudged to have been fouled, but as they say you take the good with the bad, and he stepped up to take the penalty himself and finished low to the corner to give the lads a boost (2-12 to 1-9). 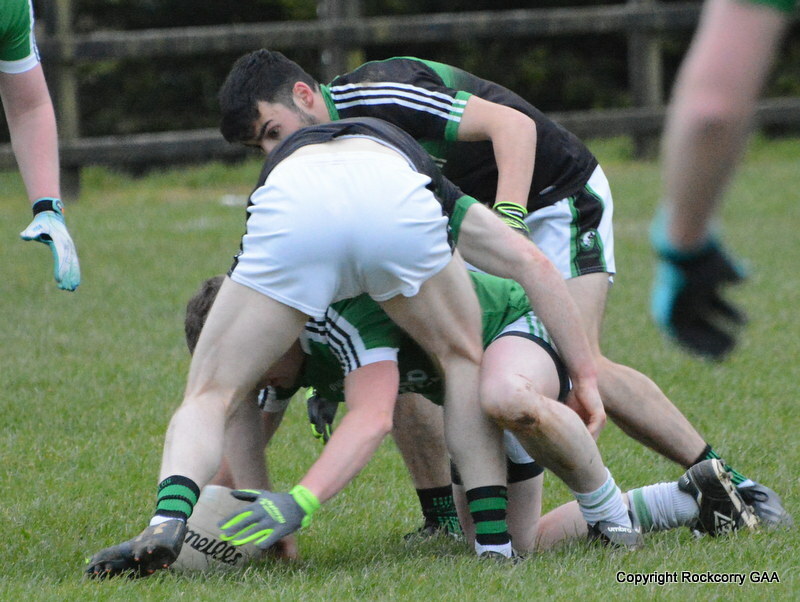 Another point from Fergal McGeough on the 18th minute seemed to signal some sort of comeback but Ballybay gained the upper-hand when they tacked on a fine point from play just before Mark McGuirk added another point, following a foul on Paul McKeown to leave the score 2-13 to 1-11. Any slim chance of a comeback evaporated when Ballybay pounced on some dreadful defending to rifle home their third goal and they fired over two more points to increase their lead to ten points, leading 3-15 to 1-11. 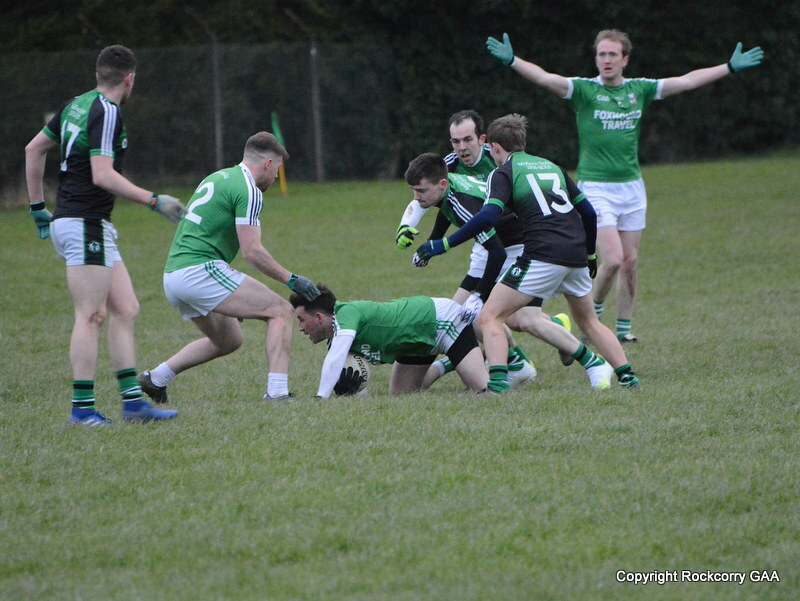 The last score of the game came from a Fergal McGeough free-kick, but at that stage it was game over as the referee blew the whistle to leave the scoreboard showing Ballybay 3-15 Rockcorry 1-12. Team & Scorers: Jamie Smith, Conor McGeough, Damien Matthews, Lorcan Smyth, Johnny Reilly, Keith Daly, Stephen Lynch, Keelan Clerkin, Martin Carroll, Noel Carroll (0-1f), Paul McKeown, Garry Calvert, Mark McGuirk (0-4, 3f), Niall McKeown and Fergal McGeough (0-7, 6f). Subs: Dwayne Rooney (1-0) for Keith Daly (injured), Anthony Tate for Garry Calvert.